Made by TP-LINK, the TL-WR841N 300 Mbps Wireless-N Router enables multiple computers to share one Internet connection, and is designed specifically to meet the networking requirements of home offices and small businesses. This combined wired/wireless network connection device offers wireless transmission rates of up to 300 Mbps along with four 10/100 Mbps ports for wired connections. Sporting a sleek exterior, the Wireless-N Router can be mounted on a wall or placed horizontally on a table or desk. Setup is as easy as 1, 2, 3! View larger. The 300 Mbps Wireless-N Router offers wireless transmission speeds of up to 300 Mbps and complies with the IEEE 802.11n standard. MIMO (Multi Input Multi Output) technology delivers improved wireless transmission rates and stability, while two omnidirectional antennas are designed to provide optimal wireless performance, transmission rates, stability, and coverage. It shows more excellent abilities of mitigating data loss over long distances and through obstacles in a small office or a large apartment, even in a steel-and-concrete building. Above all, you could easily pick up the wireless network during long-distance connection where legacy 11g products may not! 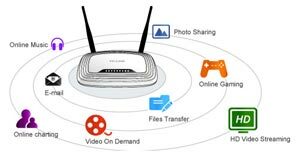 This also means the router has the speed to work smoothly with almost any bandwidth intensive application including VoIP, HD streaming, or online gaming, without the lag. Using its channel selection feature, CCA technology automatically avoids channel conflicts and promotes high wireless transmission performance in long-distance and high-interference environments. 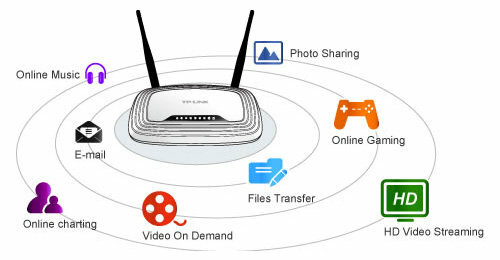 In addition to its wireless capabilities, the Wireless-N Router has four interior interchangeable 10/100 Mbps ports, allowing you to connect up to four computers directly to the router. The router's QSS (Quick Secure Setup) function complies with the WPS standard to ensure the security of your wireless network. A built-in firewall features IP, MAC, and URL filtering to flexibly control online access and time. The Wireless-N Router also supports SSID broadcast control, MAC address access control, WEP encryption, WPA/WPA2, and WPA-PSK/WPA2-PSK authentication. These combined security measures are designed to deliver stronger, safer protection and guard against intruders. This Wireless-N Router supports on-demand dialing, online access management, automatic virus isolation, Universal Plug and Play protocols, and Dynamic DNS, and has an advanced system security record. A user-friendly software interface enables all users to easily configure the router and supports free web-based software updates. Among the wireless network, indiscriminate Internet surfing and bandwidth-guzzling downloads by internal users often leave home or small office with insufficient bandwidth. This router supports the IP QoS function, allowing optimum utilization of bandwidth and offers bandwidth control over congestion, preventing the bandwidth abuse. In this way, the users of a small network receive committed and specific bandwidth, preventing non-critical applications from degrading network performance. The router is compatible with 802.11b/g/n protocol wireless products as well as Intel Centrino technology. Featuring a sleek design, the Wireless-N Router can be mounted on a wall or placed horizontally on a table or desk. It measures 1.3 by 7.6 by 5.1 inches (H x W x D). The Wireless-N Router is backed by a two-year warranty. 300 Mbps Wireless-N Router, two fixed antennas, power supply unit, resource CD, Ethernet cable, and quick setup guide.